Born in San Diego, Sally Forrest studied dance from a young age and shortly out of high school was signed to a contract by MGM. to Michael and Marguerite (née Ellicott) Feeney. Her father was a U.S. Navy career officer, who moved his family to various naval bases, finally settling in San Diego. He and his wife later became ballroom dancers and taught dance classes, where their daughter began learning her lifelong craft. Forrest began her film career as a chorus dancer in MGM musicals of the 1940s. 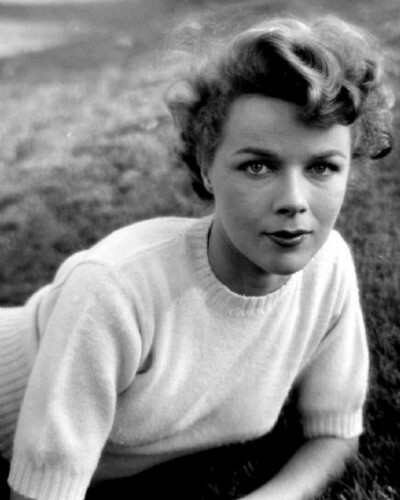 She made her acting debut in Not Wanted (1949), scripted and produced by Ida Lupino. The controversial subject of unwed motherhood was a raw and unsentimental view of a condition that was seldom explored by Hollywood. The film launched her to star in two further Lupino projects, Never Fear (1949) and Hard, Fast and Beautiful (1951), as well as other film noir films, including the star-studded While the City Sleeps (1956), directed by Fritz Lang. Her musical background and training as a jazz and ballet dancer brought roles in the transitional musicals that rounded off the golden age of MGM; most notable was Excuse My Dust (1951). Most of her films were made at MGM, which prided itself as family entertainment, but RKO, headed by the eccentric and controlling Howard Hughes, presented a very different creative challenge. Son of Sinbad (1955), now a cult classic, was one of his many pet projects where he had a personal interest in re-designing the star’s skimpy wardrobe. With each rehearsal, Sally noticed her harem dance costume slowly disappearing, until it was barely compliant with the Production Code. In 1953, after moving to New York with her husband, writer and producer Milo Frank (who was hired to be head of casting for CBS), her film work transitioned to theatre and TV. She starred on Broadway in The Seven Year Itch, and appeared in major stage productions of Damn Yankees, Bus Stop, As You Like It and No No Nanette. Later she returned to Hollywood and continued working at RKO and Columbia Pictures. Sally Forrest and Frank owned the former Benedict Canyon home of Jean Harlow and Paul Bern on Easton Drive in Beverly Hills when their tenant Jay Sebring was murdered at the nearby home of Sharon Tate. Forrest, a widow since 2004, died of cancer on March 15, 2015, aged 86, at her home in Beverly Hills, California. She left no immediate survivors.